At this point, I might be the last person in the food product review blogosphere that has gotten around to reviewing one of Ben & Jerry's entries into the rapidly growing Greek yogurt market. 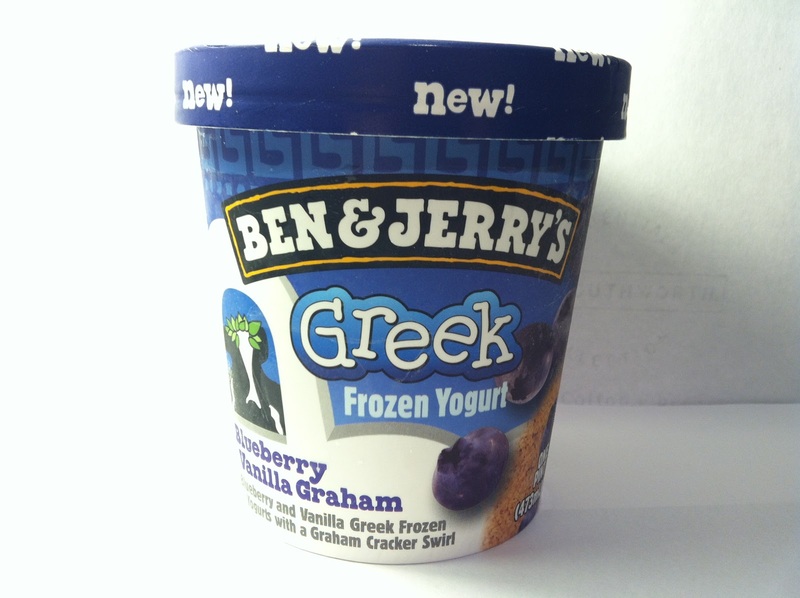 Being that Ben & Jerry's makes ice creams (and I've reviewed a bunch of them), it seems only natural that they'd make their entry into the increasingly crowded market with a frozen Greek yogurt. I've read mixed reviews of each of their new entries, but I'll start here today with the one that sounded most appealing to me, the Blueberry Vanilla Graham flavor. I picked this pint up on sale at Meijer for $3.00 and it contains four servings at 200 calories per serving. 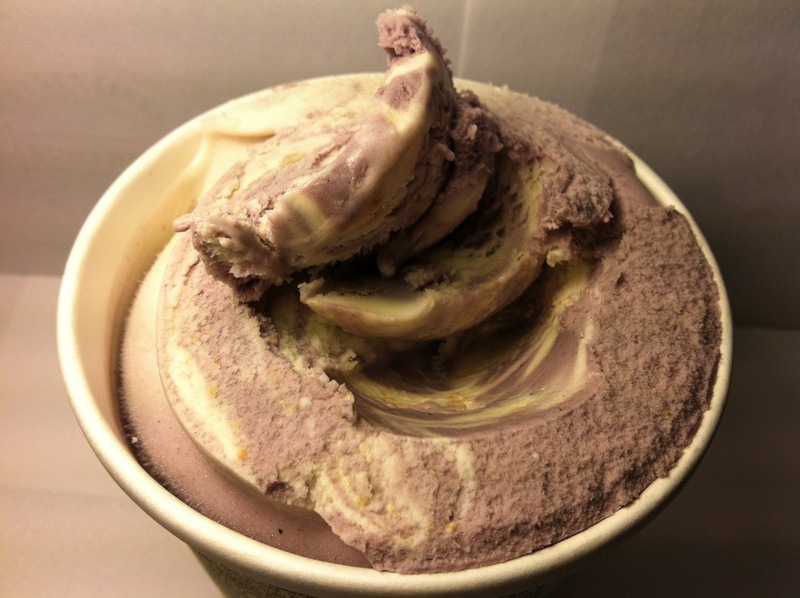 According to the Ben & Jerry's product description, this pint of Greek frozen yogurt is made up of "Blueberry and Vanilla Greek Frozen Yogurt with a Graham Cracker Swirl" and as you can see from the picture, there are definitely swirls of both blueberry and vanilla yogurts. The one thing that is hard to find, even as you dig through the pint, is the graham cracker swirl. I eventually did find it and not that I expected to find huge chunks of graham crackers, but the swirl was more of just ground up graham cracker dust and not really any discernible pieces at all. The swirl was also primarily in the middle of the pint and not very prevalent, so that was a major disappointment as the promise of graham cracker swirl and when it was so thin and flimsy, I've got to say that this pint got off to a bad start in my book. The bad start continued as I took my first spoonful. The vanilla and blueberry yogurts tasted blueberry and vanilla, but being that this was supposed to be Greek yogurt, I expected those flavors to have some of the tang that Greek yogurt usually has. In the case of this pint, it had none of that. It was really just a softer and slightly more creamy version of regular ice cream. As for the graham cracker swirl, well, the disappointment continued. Since this was mainly just graham cracker dust, it only added a slightly different mouthfeel on the rare occasion that you were able to get some in your spoonful. That mouth feel was more grainy than anything and didn't really resemble graham cracker taste at all. Buy It or Fly By It? FLY BY IT. All in all, this particular pint wasn't horrible, but its flavor definitely did nothing to meet the hype that Ben & Jerry's put out there for their new frozen Greek yogurt product line. If you are curious to see what this tastes like, then by all means buy it. I'm guessing that once you fulfill the curiosity factor, you won't be buying this again, because it really isn't all that great or memorable. It's a lower calorie than ice cream, but in this case, I don't think the lower calories are really all that worth it. No, you are not the last. We have yet to post our reviews. I had noticed that when I started looking for other reviews from my favorite sites to link, but I liked my intro so much that I just decided to keep it even though it was erroneous. Greek yogurt 'benefits' without the actual Greek yogurt taste? I'm sold! The banana PB one is definitely worth a try. The sweet & salty aspect is amazing. As much as I like peanut butter, I just can't try that one because of the bananas. I HATE bananas. I thought the Blueberry Vanilla Graham tasted like Baseball Nut (Baskin Robbins if you didn't know). I'm not a fan of Pinkberry and I loved the B&Js sweet taste. I think this product is a winner. I don't think it was bad if you enjoy a fruity/tangy 'FroYo', but it also wasn't one that I'm going to buy again just because it was sooo good. It was alright. It satisfied the sweet tooth with a little bit of yogurt benefits I suppose. Hopefully my sister will finish this pint for me.